A hernia is characterized by the protrusion of an internal organ or a body part through an opening into an area where the organ or body part is not normally present. The opening results from weakness in the tissue, muscle or membrane that normally holds the organ or body part in place. According to the Nemours Foundation, hernias occur more frequently in certain areas of the body, including the abdomen, upper thigh and groin. A hiatal hernia is named for the hiatus, which is the diaphragm opening between the chest and abdomen. The esophagus passes through the hiatus and connects to the stomach. In a hiatal hernia, part of the stomach or gastroesophageal junction, which is where the esophagus connects to the stomach, passes through the opening and into the chest. There are two types of hiatal hernias. A paraesophageal hiatal hernia occurs when the gastroesophageal junction remains in its proper place and part of the stomach protrudes through the opening into the chest. According to the Harvard Medical School, the symptoms of a paraesophageal hiatal hernia are more likely to be severe that the second type of hernia, a sliding hiatal hernia. With a sliding hiatal hernia, part of the gastroesophageal junction and stomach protrude through the opening. 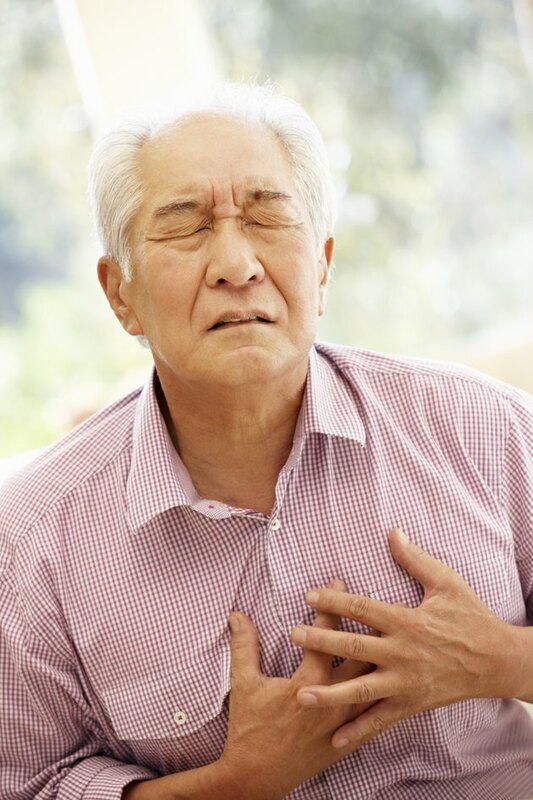 Symptoms of a hiatal hernia include a sensation of pain or pressure in the chest. There can be hiccups, belching and coughing. There can also be heartburn and difficulty with swallowing. For many people, there may be no symptoms at all. With other people, symptoms get progressively worse until medical attention is required. Hiatal hernias can also contribute to acid reflux, which is characterized by heartburn, a burning sensation in the back of the throat, regurgitation and a feeling of uncomfortable fullness after eating. A paraesophageal hiatal hernia may become trapped in the chest and be unable to return to the abdomen. If that occurs, there is the potential for the blood supply to the hernia to be cut off. This is called strangulation. Without the oxygen supplied by blood, the strangulated parts will begin to die. If this occurs, there will be a sudden pain in the chest that can be described as a sharp pain. There can also be difficulty with swallowing. This is an urgent medical situation and requires immediate medical attention.